'Perfectly Concocted Context by Jonathan Monk' brings together three generations of artists within the frame of Jonathan Monk’s studio. The walls of the gallery space are wallpapered with full-scale photographs of the interior of Monk’s studio, which contains works by many artists that Monk both admires and uses in his own practice. Against the fictive backdrop of his studio, Monk has placed inside the gallery space a diverse group of artworks. 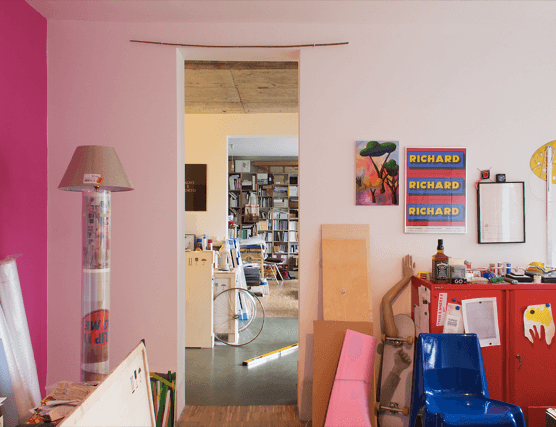 Monk presents the studio – a site of reflection and production – as a finished artwork, layering the artist’s studio within the gallery. A number of the artists included in the show have been influenced by the city of Los Angeles and its rich history of artistic production. The exhibition acts as an homage to these artists while also inviting playful parallels between the works shown in this “concocted context”. The exhibition includes works by Bas Jan Ader, John Baldessari, Nina Beier, Matt Connors, Ceal Floyer, Ryan Gander, Piero Golia, Isabell Heimerdinger, Robert Heinecken, Jenny Holzer, Louise Lawler, Sol LeWitt, Robert Overby, Michael Rey, Ed Ruscha, David Shrigley, Ettore Sottsass, Lew Thomas and Christopher Williams.